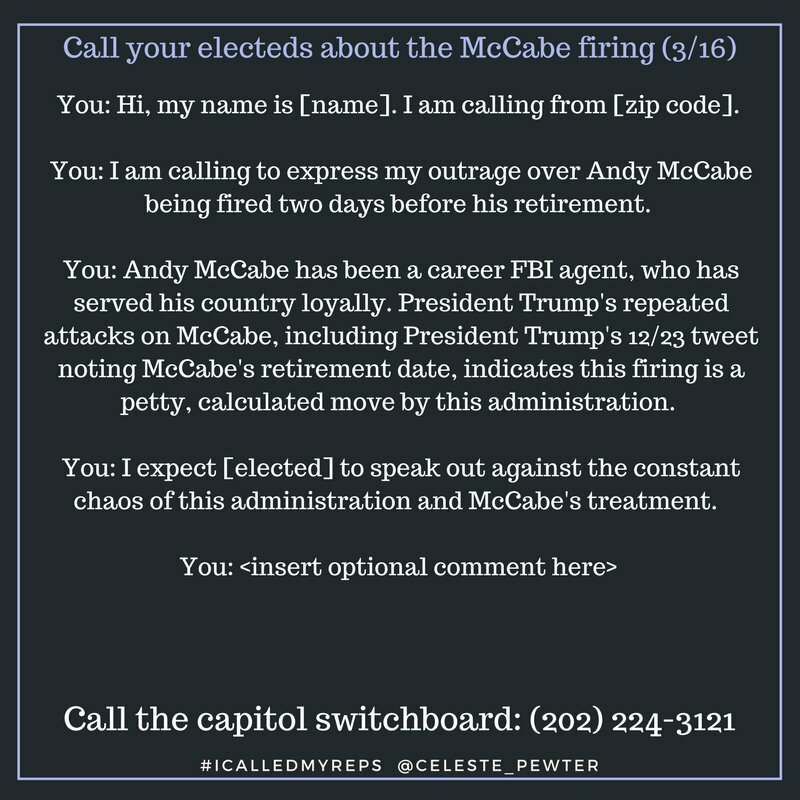 Call your members of Congress to complain, LOUDLY but POLITELY, about the firing of FBI Deputy Director Andrew McCabe. The report on which Sessions based is ruling has not been released as of Saturday, March 17, 2018. He did not accuse McCabe of lying under oath, but it’s impossible to know the strength and merits of the charges without seeing this report. Many, many, good, sharp tweets from good, sharp people followed. This is petty, vindictive behavior. We need to be OUTRAGED at how this administration is treating him. Call your electeds. If we don’t respond, and continue to respond, this will continue to happen to others. I’m serious, all. It’s easy to say: “Yep, the chaos continues.” But we need to draw a line in the sand. Incremental acceptance for this behavior, is not good for any of us. It’s not just about McCabe; it’s about the precedents being set by this administration. Let me put this another way: McCabe might be fine, with inevitable book deals and making tours of media shows. But what about all of the other staffers who are fired for getting on the wrong side of this administration, without McCabe’s job or profile? This is about them too. Eg. This story about State staffers being canned for disloyalty has been buried because of how bonkers this week has been, but what about staffers like this? Call. Your. Electeds. Now. An addendum: If you don’t think McCabe’s firing is a petty PREMEDITATED move, I present Trump’s 12/23 tweet: https://twitter.com/realDonaldTrump/status/944666448185692166 … As I said, call your reps. Or this will keep happening. Don’t just write this off as more drama for this week. So, that’s your task for Monday. Call your two Senators and your House rep and make it damn clear (politely, always politely) you protest the firing of McCabe and you want them to, too. We can’t stress this point enough. Humiliating as that was for McCabe, he has recourse, and ultimately, he will be fine. We need to stick up for the anonymous cogs in the governmental system who are refusing to carry out illegal and outrageous orders from the Trump administration–the people who are too minor to attract seven-figure book deals and too obscure to command a following if they quit their jobs rather than do something wrong, or risk their pensions by refusing to do wrong. In addition to following Pewter on Twitter (again, her handle is @Celeste_Pewter) you can support her in other ways. After you call your MoCs, tweet about the experience using the #ICalledMyReps hashtag.